A number is called perfect number, if the number is equal to the sum of all of its factors except itself. For example, 6 , 28 are perfect numbers. 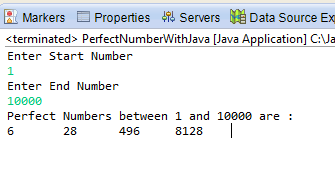 Now the following program prints all the perfect numbers between two given numbers .